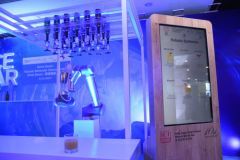 The robotic bartender demonstrates how to mix cocktail at the Ice Bar. Two 30-minute demonstrations are held each day. Public Day valid ticket holders can have a taste of six kinds of cocktails, served by the robotic bartender on the last day of the fair. 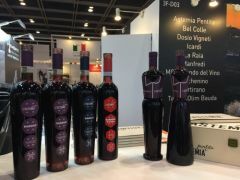 L"ASTEMIA Pentita from Italy brings to the fair wines from Barolo. One of the wines from year 2013 was carried in man and woman-shaped bottles, adding more fun to the palate. Front row (from L): Dejan Zidan, Deputy Prime Minister and Minister of Agriculture, Forestry and Food of the Republic of Slovenia; Paul Chan, Financial Secretary of the HKSAR Government; and Margaret Fong, Executive Director of the HKTDC, attend the Opening Ceremony of the 2017 HKTDC Hong Kong International Wine & Spirits Fair. HONG KONG, Nov 9, 2017 - (ACN Newswire) - The 10th edition of the HKTDC Hong Kong International Wine & Spirits Fair opened today and will continue until 11 November at the Hong Kong Convention and Exhibition Centre (HKCEC). Organised by the Hong Kong Trade Development Council (HKTDC), the fair welcomed Paul Chan, Financial Secretary of the Hong Kong Special Administrative Region (HKSAR) Government, as the guest of honour at this morning's opening ceremony. "Entering its 10th anniversary, the Wine & Spirits Fair has grown to become a major event of its kind in Asia," said Margaret Fong, Executive Director of the HKTDC. "This year's fair features 1,070 exhibitors from 38 countries and regions. We are particularly pleased to welcome first-time exhibitors from Malaysia, Mauritius, Romania, Serbia and Ukraine." Hong Kong's wine industry took off after the HKSAR Government eliminated all duty-related customs and administrative controls on wine in 2008. Wine imports have since jumped more than seven-fold, from HK$1.6 billion in 2007 to HK$12 billion in 2016. As the region's renowned wine trading and distribution centre, Hong Kong serves as a gateway for global wine traders to enter Asian markets. This year's Fair features more than 30 group pavilions representing wine-producing regions, trade organisations and governmental organisations from around the world. Among them are new pavilions organised by the Syndicat General des Vignerons de la Champagne (SGV) of France, Southern United States Trade Association, the Russian Export Center, Enterprise Mauritius, Confederacao dos Agricultores de Portugal, Setubal Peninsula Wines of Portugal, and Asociatia Producatorilor si Exportatorilor de Vinuri of Romania. The central European country Slovenia, which has a growing beekeeping industry, is debuting the "Bee World" Interactive Pavilion at the fair to promote "World Bee Day" (20 May), as proclaimed by the United Nations General Assembly. Some Slovenian exhibitors will also showcase wines made from honey. Dejan Zidan, Slovenia's Deputy Prime Minister and Minister of Agriculture, Forestry and Food, attended the wine-tasting session, "A Flight of Wines from Slovenia," to promote the country's fine wines. Bilateral trade between Slovenia and Hong Kong has been growing in recent years, with Slovenian agricultural and wine exports to Hong Kong exceeding EUR 500,000 in the first half of this year. 1) Robotic Bartender Demonstrations at the Ice Bar. 3) Chateau Mercian Nagano's Chardonnay Unwooded 2015 from Japan, the Gold Award winner of the International Wine Challenge 2017. Japan's oldest winery, Chateau Mercian has been operating since 1877. This white wine presents a refreshing peach and lemon peel flavour. 4) Dictador 20 Years Solera System Rum from Colombia. With 15 international awards to its name, the rum is one of the world's most awarded varieties of its kind, thanks to its combined use of ancient recipes and modern technology. 5) The 2014 Girard Cabernet Sauvignon from the United States. It was served at the first state dinner US President Donald Trump hosted for Chinese President Xi Jinping. Theme zones include Liquor & Beverage Products, Friends of Wine, Wine Education and Wine Accessories Equipment and Services, helping to foster the industry's development. 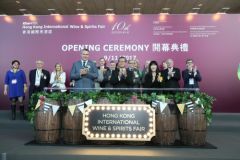 The Wine & Spirits Fair marks its 10th anniversary with the debut of the Asia Wine Academy, co-organised by the HKTDC and the Hong Kong Polytechnic University School of Hotel and Tourism Management (SHTM). Based on the SHTM's MSc in International Wine Management programme, two courses will be conducted by Masters of Wine Jeannie Cho Lee MW and Steve Charters MW, entitled "Contemporary Trends in Wine Consumption" and "Mastering Tasting & Rising Wine Trends" respectively. Participants will be awarded a certificate of attendance. During the fair, more than 70 events will be held to provide a comprehensive business exchange platform for visitors. These include a Wine Industry Conference, a gala dinner, thematic seminars and more than 50 tasting sessions presenting fine wines from Australia, Germany, Bordeaux (France), Japan, Italy and Slovenia. Some of the highlights of today's opening day include the Wine Industry Conference, entitled "Trends to Watch in 2018: The Business of Bubbles and Beyond," as well as the ninth Cathay Pacific Hong Kong International Wine & Spirit Competition Award Ceremony, to be held this evening followed by a Gala Wine Dinner. Under the theme "Cabaret Festival," the Gala dinner features a menu prepared by two Michelin-starred Chef Fabrice Vulin from the Macau French restaurant, The Tasting Room. A seminar entitled "Improve Your F&B Operations by Teaming up with Wine & Beverage Suppliers" will be held tomorrow, as well as the buyer forum "Easy Access: Facilitating Wine Trade to the Mainland Market," where speakers will discuss the hottest industry topics. The Wine & Spirits Fair will be open to public visitors aged 18 or above* on the last day (11 November). Regular tickets are priced at HK$200 each. Valid ticket holders on that day will receive a Lucaris crystal wine glass on a first-come first-served basis and while stocks last. Events held on Public Day include the wine-tasting master class, "Welcome on Board to a First-class Wine Journey by Debra Meiburg, Master of Wine." Public visitors can also attend beer workshops, wine tastings, cocktail, whisky and liquor demonstrations, and seminars including "Enjoy Sake from Kumamoto with Kumamon," "What Makes a Good Wine? ", "Choosing from a Wine List," and "How a Hongkonger Made Wines in Italy," a sharing session by Hong Kong Wine & Spirits Writers Association Chairman Ronny Lau. The Hong Kong Wine Competition 2017 will also be held on Public Day. The HKTDC is again organising the Hong Kong Wine Journey citywide promotion, putting together more than 90 wine-related activities in November. While Fair visitors can enjoy free corkage at selected restaurants, the public can take part in a series of events, including wine tasting, themed tours and wine-and-food pairing sessions. For details, please refer to the Hong Kong Wine Journey map or the Fair website. Public Day tickets to the Wine & Spirits Fair are priced at HK$200 each and are sold on site. Until tomorrow (10 November), visitors can also purchase Public Day tickets at a special price of HK$99 on HOKOBUY, FeedMeGuru, Yahoo, Group Buyer, GOBUYA and HKTVmall; or they can purchase mobile tickets on TNG Wallet. Visitors with valid tickets will receive a Lucaris crystal wine glass on-site on a first-come, first-served basis, while stocks last. Public visitors can also enrol in the Asia Wine Academy at a special price of HK$690 (original price: HK$990) on the Wine & Spirits Fair website, online group-purchase platforms, Timable, Feedme Guru or TNG Wallet. The price includes a complimentary Wine & Spirits Fair ticket and a Lucaris crystal wine glass, valued at a total HK$1,300 on a first-come, first-served basis, while stocks last. Established in 1966, the Hong Kong Trade Development Council (HKTDC) is a statutory body dedicated to creating opportunities for Hong Kong's businesses. With more than 40 offices globally, including 13 on the Chinese mainland, the HKTDC promotes Hong Kong as a platform for doing business with China, Asia and the world. With 50 years of experience, the HKTDC organises international exhibitions, conferences and business missions to provide companies, particularly SMEs, with business opportunities on the mainland and in international markets, while providing information via trade publications, research reports and digital channels including the media room. For more information, please visit:www.hktdc.com/aboutus. Follow us on Google+, Twitter @hktdc, LinkedIn.